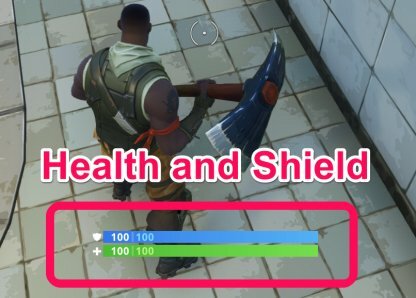 This guide focuses on the health & shield basics in Fortnite. Learn to protect yourself out there. More Basics For Beginners Here! The green bar represents your health, while the blue bar represents your shield. These two bars indicate how much damage you can take before being knocked out or eliminated. When the value of your health bar reaches 0, you get knocked out or eliminated. Your health also takes damage over time when you are caught in the storm, so be careful! These items when used will restore a portion of your character's health. Also included are the amount of time needed to apply each item, the amount of health they restore, and their restrictions. Bandages heal for 15 points of health. It takes 4 seconds to use this item, but you cannot use anymore bandages when you reach 75 health. You can have a maximum of 15 Bandages in one slot. It takes 10 seconds to use this item, but it can heal you back up to 100 health. 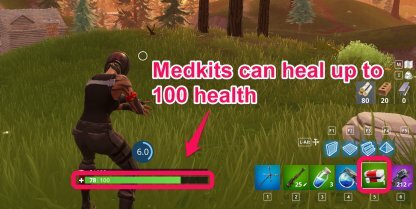 You can have a maximum of 3 Medkits in one slot. Apples can be found lying around the map in certain areas. You can consume an apple to heal 5 points of health. You can consume apples to fully heal yourself. When you get hit, your shield will take damage first before your health bar. It allows you to take more damage before being knocked down or eliminated. However, your shield will not protect you from the storm or from fall damage! These items when used will restore a portion of your character's shield. Also included are the amount of time needed to apply each item, the amount of shield they restore, and their restrictions. Small shield potions restore 25 points of your shield. It takes 2 seconds to apply, but you cannot use small shield potions once your shield reaches 50 points. You can have a maximum of 10 Small Shield Potions in one slot. Shield Potions restore 50 points of your shield. It takes 5 seconds to apply, and can restore your shield back up to 100 points. You can have a maximum of 2 Shield Potions in one slot. Blue Mushrooms can be found lying around the map in certain areas. You can consume a mushroom to restore 5 points of your shield. You can consume mushrooms to fully restore your shield. In the game, there are items that restore both your shield and your health. Consuming a Slurp Juice will heal you 75 health over 150 seconds. 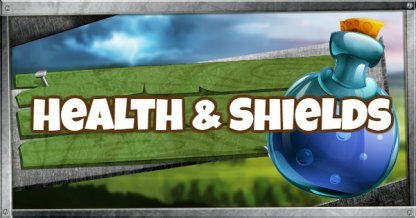 If your health is full, it will restore your shield the same way. You can have a maximum of 2 Slurp Juices in one slot. The Chug Jug fully restores your shield and health to 100 points, but takes 15 seconds to fully consume. You cannot do anything else while consuming the Chug Jug, so make sure you're alone.. You can only have 1 Chug Jug in a slot. Have you recently taken damage? Is the fight still on-going? 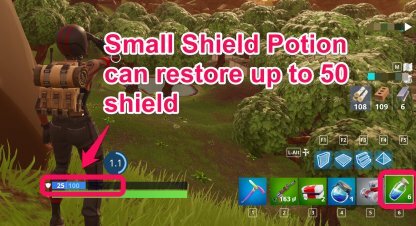 Efficiently heal and shield up with these tips! Finish the fight as soon as you can. If you believe that you can not take out the enemy, get away from the area and make sure the enemy won't follow you! Some of your items take time to heal you up, and you will not be able to do anything else while consuming some of these items. So find or build a place that breaks a potential enemy's line of sight! Now that you are well-covered, use this time to heal yourself and restore your shields. Use smaller items first due to lower cast time, so you have HP and shield in case enemies break down your cover before you can fully heal.